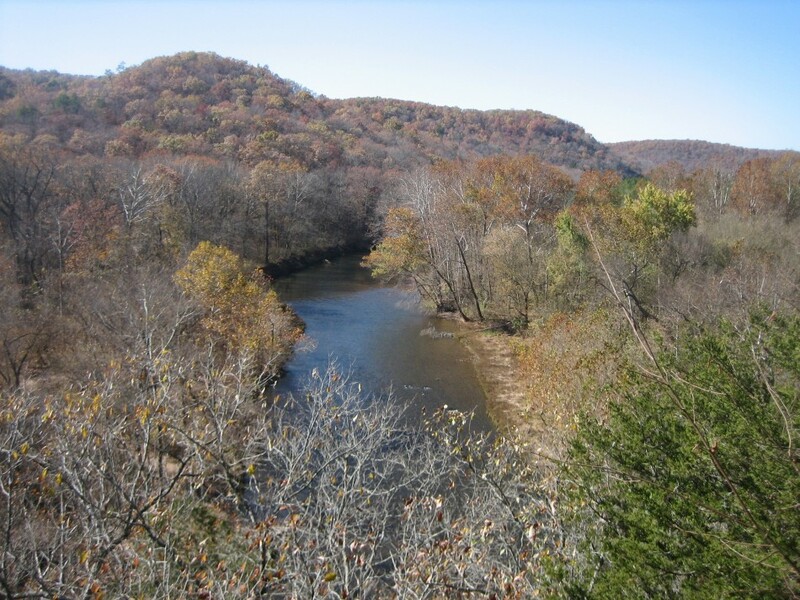 The 16,227 acre Irish Wilderness is found in the Ozark Mountains of southern Missouri. The topography is pure Salem Plateau, characterized by flat topped hills cut by streams and rivers. 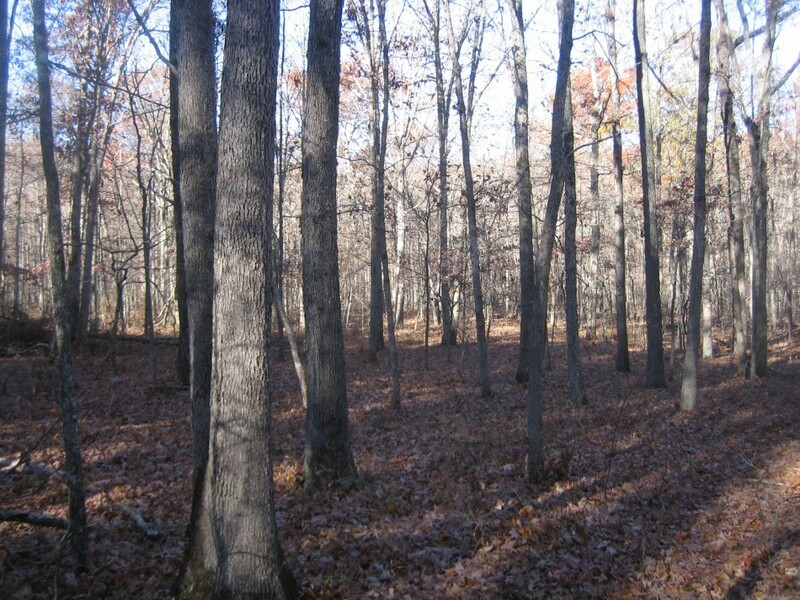 It is your typical Ozark forest of oak, hickory and a smattering of short leaf pine on a substrate of Ordovician Rocks. Its location next to the Eleven Points River gives hikers a chance to cool down in one of Missouri's National Wild and Scenic Rivers. 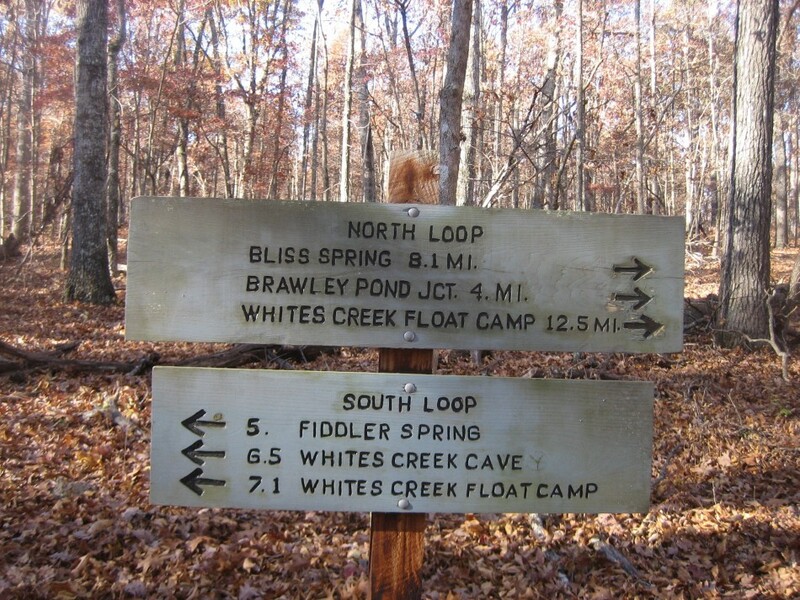 The main trail in the wilderness is the 19.6 mile Whites Creek Trail. The Irish Wilderness is named because it was settled by Irish immigrants before the Civil War. Lead by a Catholic Priest, Father John Hogan, it was a place to escape the difficult urban life of the time. However, caught between the armies of the North and the South and harassed by raiders, they disappeared during the war and their fate remains a mystery. 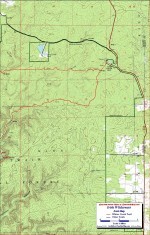 After the Civil War, the area was clear cut along with the the rest of the Ozarks. Historical accounts speak of the white oaks being so huge one could ride a horse through the forest without bending over. The pines had trunks that were measured in feet. These were harvested and gone by the 1920s. Now the wilderness is coverer by an oak-hickory assemblage barely 70 years old. In the Irish Wilderness, the surface rocks are Ordovician sandstones and carbonates. They were deposited in a shallow sea that surrounded the pre-Cambrian St. Francois Mountains of the Ozark core. The carbonates were originally limestone reefs. Since then, some of the calcium in the limestone has been replaced with magnesium and the rocks are now dolomites. The sandstones represent a beach environment along the coast line surrounding the St. Francois land mass. Most of the wilderness is underlain by the Roubidoux Formation, a sandstone with chert and dolomite layers. Below it and exposed along the Eleven Points River and the adjacent hollows is the Gasconade Dolomite. 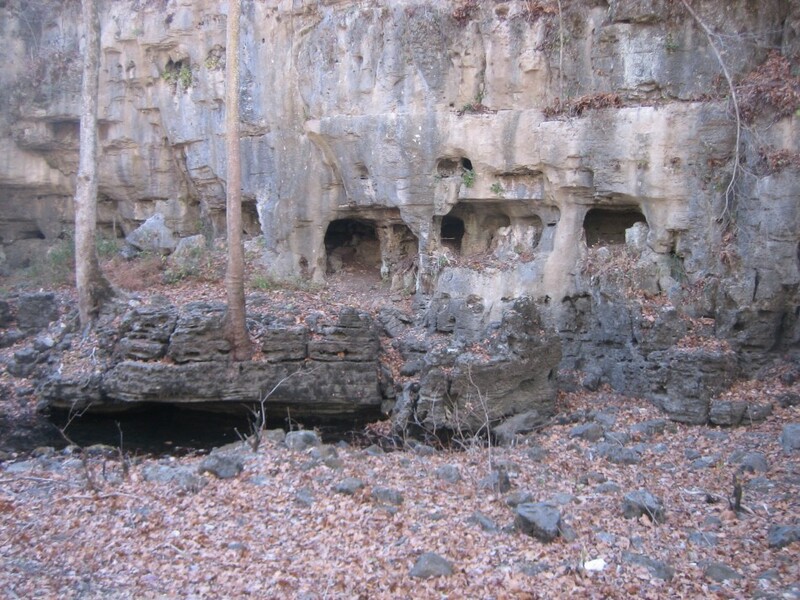 The upper layer of the the Gasconade is a cave former and the cause of the karst features in the area. Underlying the area around the Camp Five Trailhead is the Jefferson City Dolomite. The Map of the Wilderness: There are three FREE maps on this page. Each are true 1:24,000 scale based on the USGS 7.5 minute quadrangles. The "Full" map is the entire wilderness in one map that provides continuity across the wilderness that the West and East maps don't have. 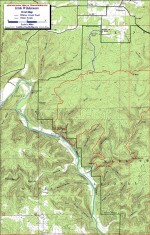 The West and East maps highlight the Whites Creek Trail and are pre formatted to print on 11x17 paper. Alternatively, the East and West maps are available on 11x17 Rite in the Rain weatherproof stock for $5/sheet ($10 for the set) plus S&H. Email cew5151@gmail.com. The red trail is the Whites Creek Trail which I tracked November 7-8, 2010. 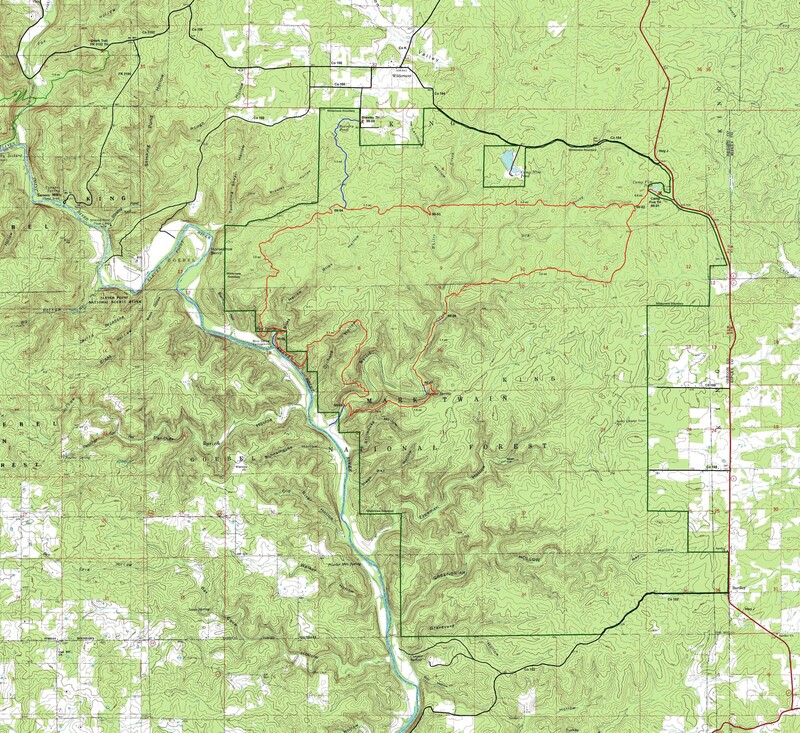 The blue tracks are from the Forest Service GIS database. I had the the Forest Service track of the The Whites Creek Trail on the hike and it matched very well with the track I was taking. In addition, the intersections were spot-on, too. I believe you will find the blue trails to be accurate, but if you find an error, send me an email with the correction. 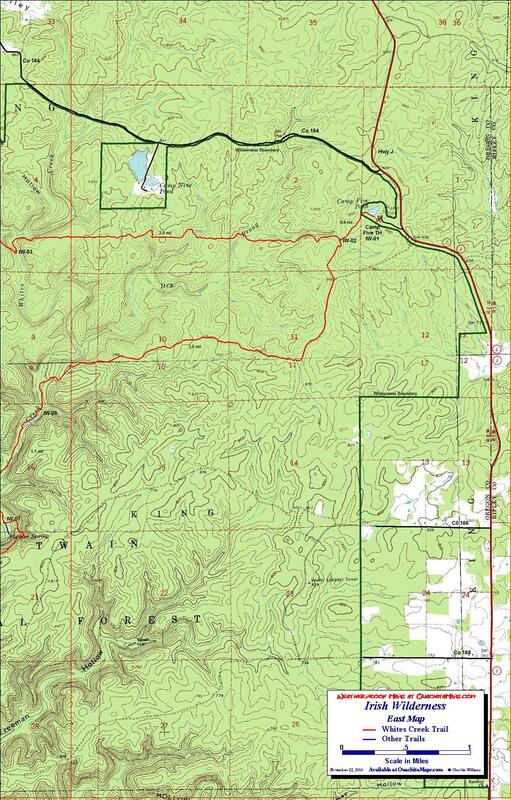 The small section of Ozark Trail in the northwest portion of the "Full" map is from the Ozark Trail Association. 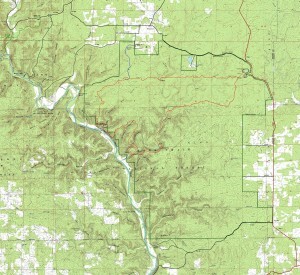 The wilderness boundary is outlined in green. Waypoints are designated with a red dot and labeled IW-00. The mileages shown are between waypoints. Tracks of the Entire Wilderness: This link is to a Google Earth KML file for all the tracks on the Full map. You should be able to right click the file and save it on your computer. Then open it with Google Earth to see the entire wilderness trail system in interactive 3-D. Once in Google Earth you can access individual tracks. If you have the right software you can select the tracks you want and load them on your GPS. The Hike: The Irish Wilderness is easily accessible from County Road J which in turn is accessed by either US Highway 60 or US Highway 160. If you have the option, US Highway 60 (the northern route) is a 4 lanes and pretty straight. US Highway 160 (the southern route) is 2 lanes, very curvy and hilly. Highway J is a two lane blacktop so you can get to the Camp Five Trailhead in any type of vehicle. The entrance to the Camp Five is well marked with a wilderness sign. Follow the gravel road a quarter mile to the parking area. 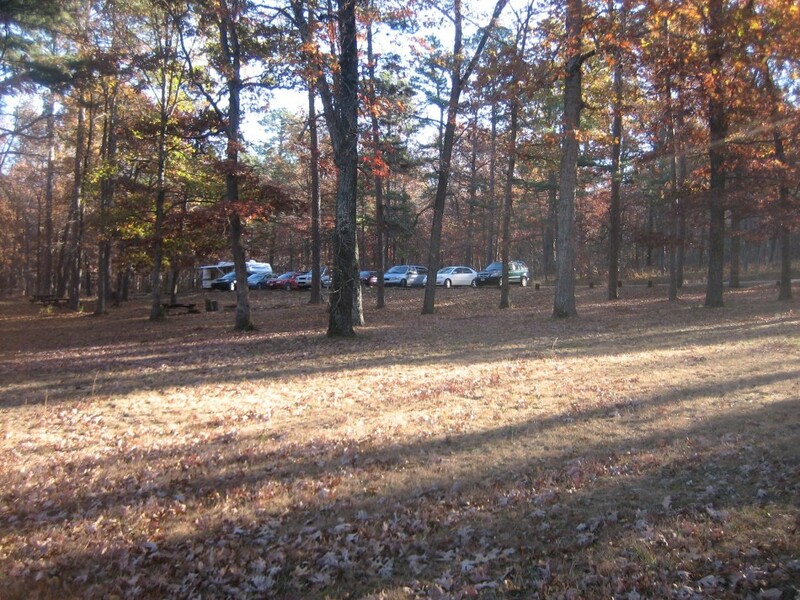 The trail head is a picnic area with no services. There were no "no camping" signs but there was not water, toilets or tent pads. If you need to camp the only water is the Camp Five Pond. 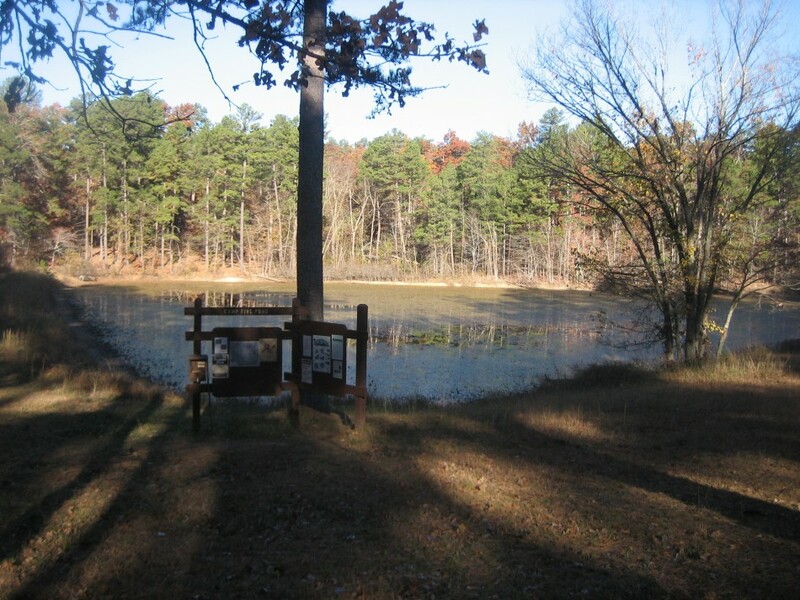 To reach the trail, head towards the left side of the pond where there is an information board and sign in box. The trail crosses the earthen dam and heads into the wood. In 0.4 miles, signs will mark the beginning of the loop trail (IW-02). This narrative will describe the counter-clockwise hike. What the signs call the north loop is the lesser used trail. While the trail has a few sparse grey plastic trail markers, you will need to rely on the path of the trail which in November was blanketed with leaves. There were several places where the tread was completely covered requiring a little scouting to find where the trail picked up again. The trail follows a westerly course along the sides and over saddles of the low forest covered hills. Lots of hardwoods and lots of leaves. It had been dry for several weeks and there was no water in any of the creeks. This was also true at the Whites Creek crossing at IW-03 (mile 3.4). Although it is a reasonably sized hollow with clear signs of down-cutting from the water flow, there was not much of a channel making one wonder if it ever has much water. At the top of a short climb out of the creek there is a sink hole to the left. It looks like the rest of the forest but you will notice that it is a bowl with no water outlet. At IW-04 (mile 4.7) is the junction with the spur to Brawley Pond trailhead. The spur is marked with a sign post and Whites Creek Trail in this area is on an old forest road so it is wide and straight. At 6.3 miles the trail drops in and out of a tributary of Barn Hollow Creek and then circles high around another tributary. Another mile along a hilltop and then a decent into Bliss Hollow. Bliss Spring (IW-05, mile 8.6) is right off the trail coming out of the bottom of the bluff. In spite of the dry weather, the spring was running clear and cold. While there is a fire ring and a mediocre area for a small tent, there is a much better place to camp down the spur trail towards the river. Walk about 0.2 miles to a the former homestead. It is now a large flat area with a rock chimney. The Eleven Point River can be seen a few hundred feet away through the trees. The Whites Creek Trail climbs out of the hollow and follows the bluff overlooking the river. This section of trail was quite a bit rougher than the rest of the trail. After leaving the bluff and climbing out of a hollow, the trail climbs to the top of a hill and stays there for about 1.2 miles. Next it is down hill into Whites Creek. As the trail follows the creek towards the river it passes the base of a bluff honeycombed with caves. I met a party near there that said there was another cave further up the bluff, but I don't know where it is. 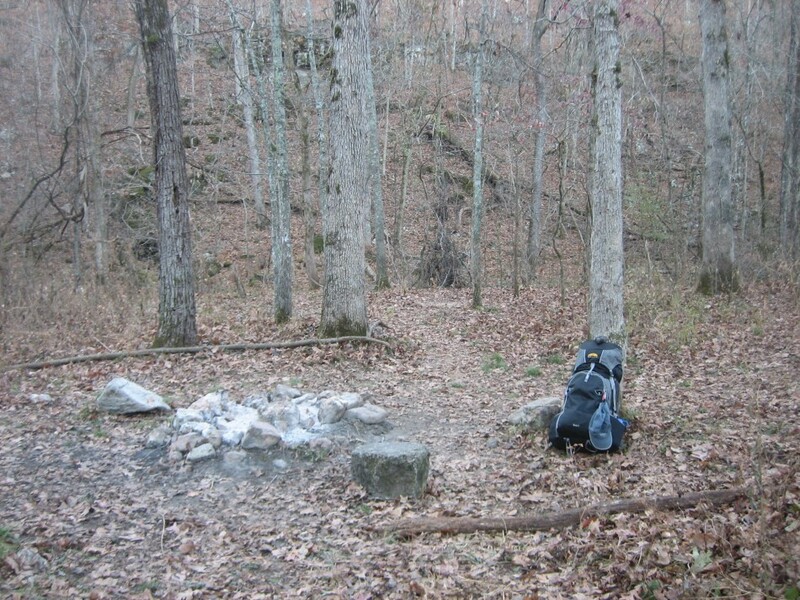 At IW-06 (mile 12.7) is a spur trail to the river and float camp. The trail climbs about 300 feet out of the hollow and passes Whites Creek Cave along the way. 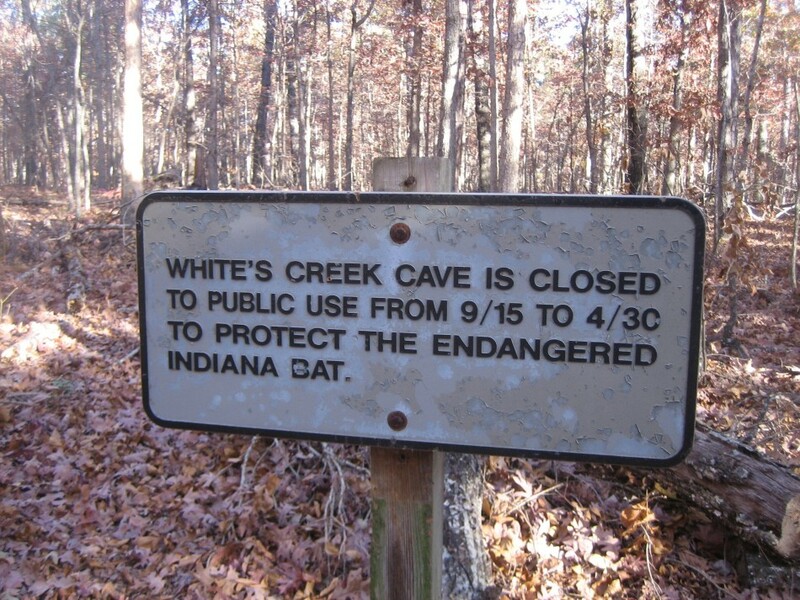 The cave is closed between September 15 and April 30 to protect the endangered Indiana bat population. The closure is assured by jail bars. After about a mile on top of a ridge, the trail descends back into the Whites Creek hollow. IW-07 (mile 14.5) is the spur trail to Fiddler Spring. 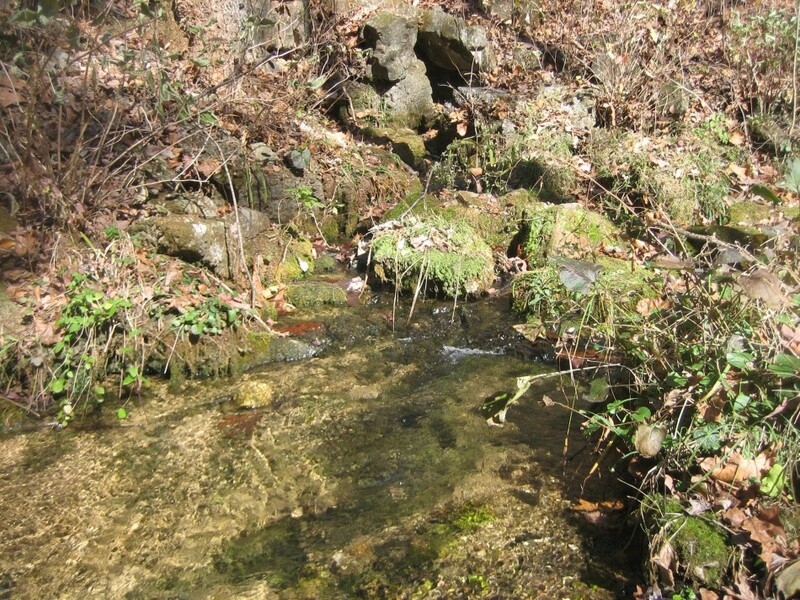 This spring was also flowing with cold clear water. There is a small campsite with a fire ring and room for a couple tents. The next 1.4 miles is along Whites Creek. While the creek bed may be dry, there is permanent water in pools. 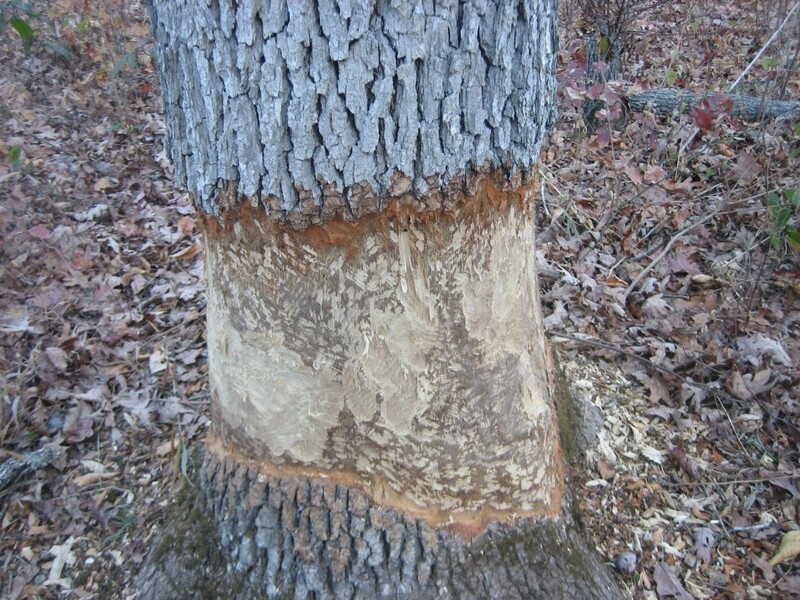 One had some beaver activity. Although the large pool was formed naturally by a gravel bar, beavers were working on cutting down two good sized trees along the bank. They were also building a lodge in the pool. Although the water is clear, be sure to treat it. Beavers are a common host for giardia. After crossing the creek (IW-08, mile 15.6) the trail climbs back to the top of the ridge. About 3 miles later is the junction of the spur trail back to Camp Five Pond (IW-02, mile 19.2). The total loop, including the spur, is 19.6. miles. Info: USGS 7.5 minute Quadrangle: Riverton and Wilderness (trails not shown). 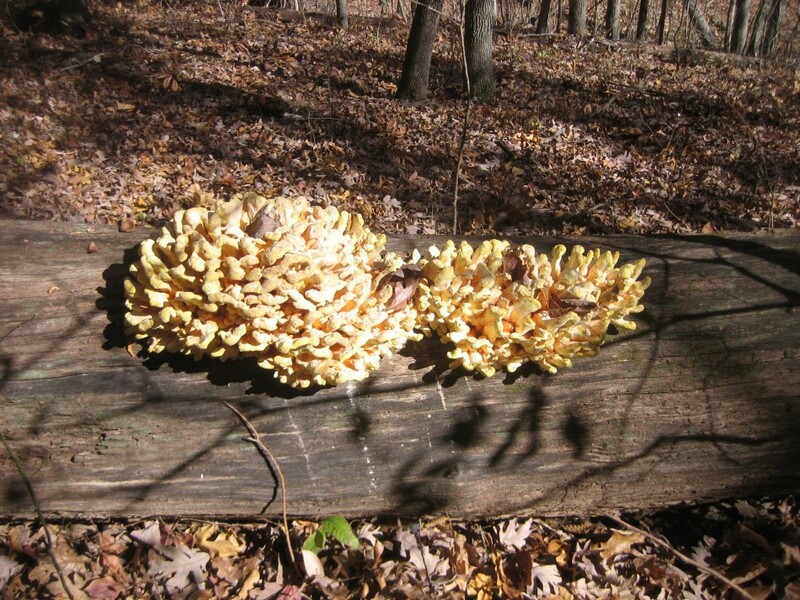 Mark Twain National Forest, Rolla, MO, (573) 364-4621. 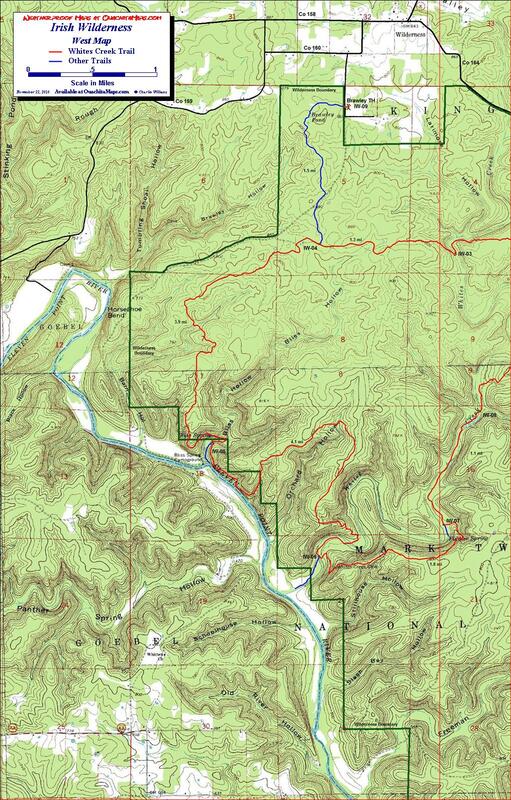 Eleven Point Ranger District, Doniphan, MO, (573) 996-2153. To Buy Maps: These maps are FREE. Click on image to access full size maps and download them. The East and West maps are also available as a two map color set on weatherproof, Rite-in-the-Rain paper (11x17). The maps are $5/sheet ($10 for the set) plus S&H by emailing cew5151@gmail.com.